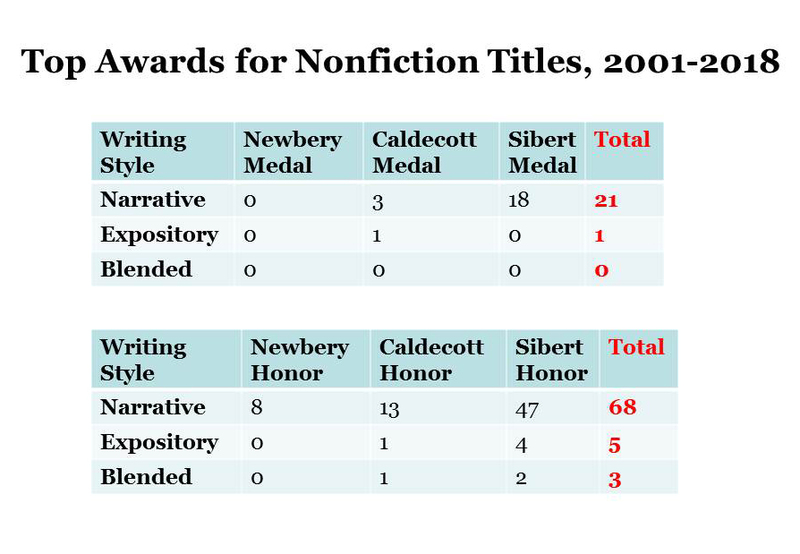 Celebrate Science: Expository Nonfiction: Some Students Prefer It! 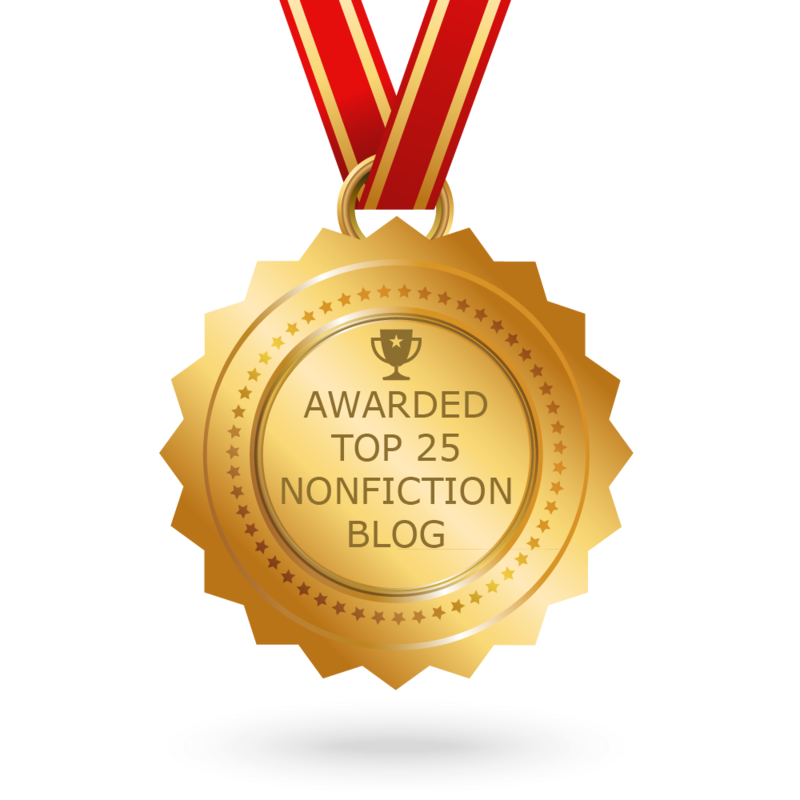 Last fall, I wrote a series of blog posts with one goal in mind: To raise awareness about research into children’s nonfiction reading preferences. Why? Because the results are surprising. In recent years, narrative nonfiction has been basking in the limelight. It receives more starred reviews, garners more awards, and ends up on more classroom and library bookshelves than expository nonfiction because gatekeepers—the adults who make up the children’s literature community—tend to have a natural love of stories and storytelling. 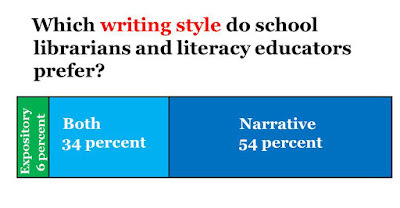 That’s why they chose jobs as librarians, literacy coaches, reading specialists, editors, book reviewers, etc. rather than accountants or engineers. 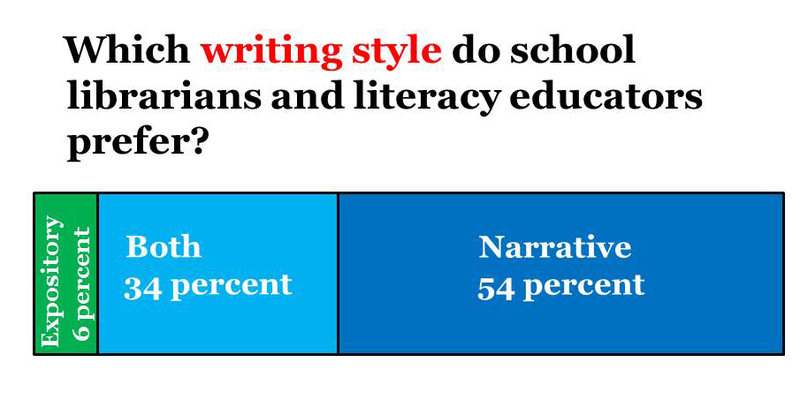 To prove my point, here are the results of a survey I conducted with more than 1,000 educators. 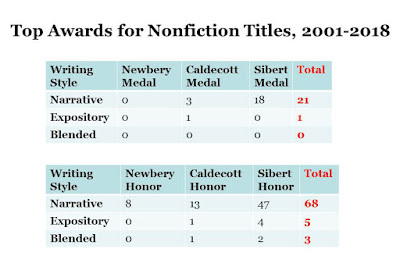 These results are supported by an analysis of American Library Association’s Youth Media Award winners since 2001 (when the Sibert Award for Informational Books was first given). But a growing body of research shows that many children think differently. They prefer reading books with an expository writing style. Rather than craving an emotional connection with the central figure in a book, these info-kids read with a purpose—to understand the world and how it works. They’re captivated by fact-filled books that include patterns, analogies, concepts, and calculations. For these students, expository nonfiction is the gateway to literacy. But that’s not all we can glean from the research. It turns out that expository nonfiction also builds content knowledge, leads to success in school, and prepares students for those dreaded standardized tests. To explore these topics in greater detail, I’ve teamed up with Marlene Correia, director of curriculum and assessment for the Freetown-Lakeville Regional School District of Lakeville, MA and past-president of the Massachusetts Reading Association. Over the last few months, we’ve created two handy dandy infographics. The first one (shown above) highlights 5 Reasons to Share Expository Nonfiction with Students. The first reason—Some Students Prefer It! —is what I blogged about in depth last fall and is summarized with the visuals above. Over the next few weeks, Marlene and I will be discussing the other four points—one per week—in greater detail on Wednesdays. On Fridays, we’ll share ideas related to our second infographic 5 Ways to Share Expository Nonfiction with Students. Here’s a sneak peek. We hope you’ll come back on Friday to find out more. This is very interesting, Melissa. I don't know what you'd call my writing style because it has always been blended. When I studied science in college and graduate school I had a LOT of labs. There was absolutely no integration of the lab work and the lecture. As early as the first publication of Science Experiments You Can Eat (1972), I integrated expository material for the scientific principles behind the question that was explored with hands-on activities. This validated the concepts as the reader became his/her own primary source by doing the activities --hence no need for back matter. SEYCE has endured because it is a lab manual that includes settled science in physics, chemistry and biology. Since then I have revised the book twice (the latest in 2016) but only to add new material expanding the topics and updating procedures for reagents, etc. that have disappeared from stores but can now be found on line. On occasion, even in the first version, I included narrative anecdotes to bring the expository material to life. I Face the Wind (2004), for pre-literate children, which presents observation with activities in a narrative form and takes the reader away from the book, temporarily looks like a picture book but includes a note to the reader on how to share the book with the child was the first picture book and first science book to receive a Sibert Honor in 2004. My latest book, How Could We Harness a Hurricane? (2017) a STEM notable, has it all--activities, expository material, narratives which I employed as dictated by the material that I had to discuss. One of the interesting things about the new nonfiction literature is that authors are using creative ways to introduce material. Read my review of Heather L. Mongomery's upcoming Something Rotten: A Fresh Look at Road Kill. (https://www.vickicobbsblog.com/blog/lessons-from-the-dead ) If I had to fit it into a genre, I'd call it a memoir. Just as the novel has used stories to illuminate various aspects of the human condition, nonfiction authors are using a variety of formats to communicate knowledge of the real world through their own personal and very human filters. Most of your books are expository. Many books are blended--it's a continuum. 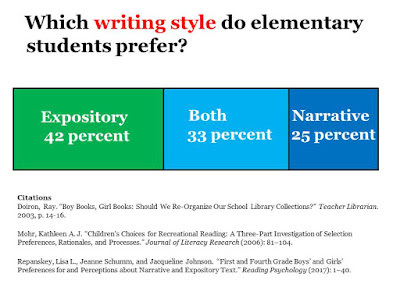 But there are books that are mostly narrative and others that are mostly expository, and those are the ones used to test children and that I used in my survey. "So agree with this! Children, librarians often tell me, come in and ask for books about how things are made, about how stuff works, about science and nature - not every child wants stories. Expository literature, as Stewart has discussed before, can be exciting, creative, and fresh. Even fun!" Thanks, Roxie. 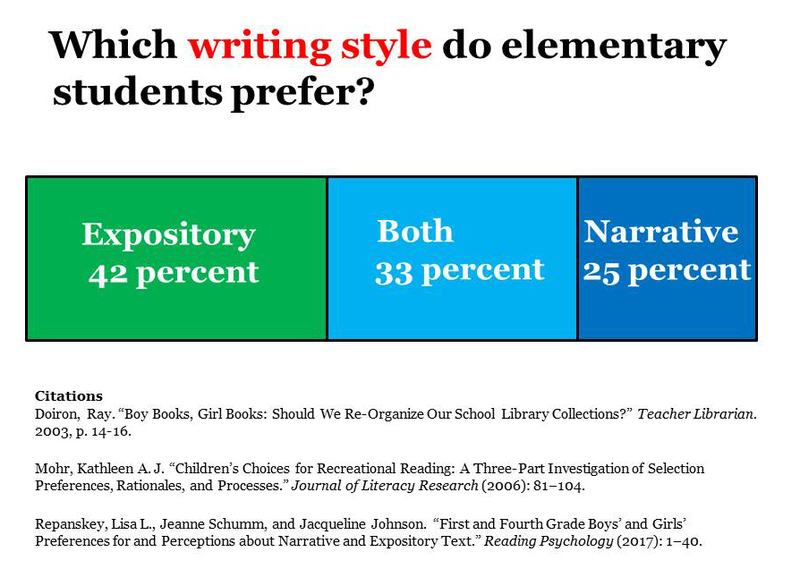 The more I talk about this topic, the more I hear from librarians and teachers about students who prefer expository nonfiction. It's so important for book collections to include the kind of nonfiction that info-loving kids are most likely to fall in love with. That's how we create life-long readers who love learning.